Cucumbers are some of the most refreshing and cooling foods you can have in summer. Here are more ways to use vitamin c-rich cucumber in summer. Cucumbers are a summer-friendly vegetable that you can have in many ways to cool your body down and give it some respite from the rising temperatures. Cucumbers are made with over 90 per cent water. It can hydrate your body and help it get rid of toxins because of its diuretic properties. But along with water, it also has other nutrients like fibre, potassium which help regulate blood pressure, promote weight loss, ease digestive problems and alleviate acidity and heartburn. Did you know that cucumber can also help you get rid of bad breath? Eat plain cucumber slices regularly to have fresh breath. Cucumber can impart many beauty benefits too. From dark circles to blemishes and acne to fine lines, cucumber has the ability to treat these problems with regular consumption and topical application too. Cucumber infused water: One of the simplest ways to include cucumber in your diet is by infusing it in water. All you need to do is put slices of cucumber in a bottle of water. Cucumber doesn’t have a strong taste so you can drink the water as is. 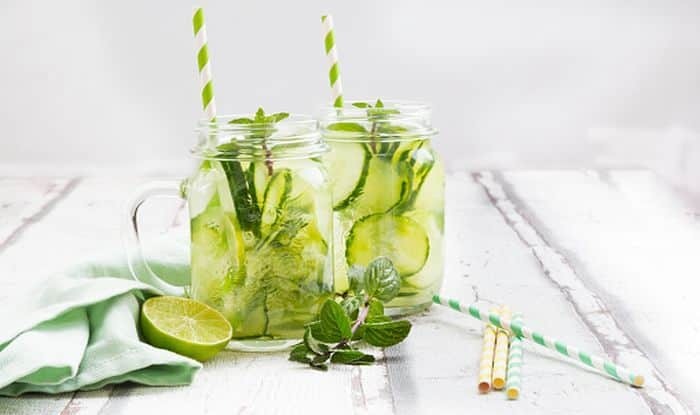 If you want to make the infused water more nutritious, combine slivers of ginger, mint leaves and lemon slices along with cucumber in the water. Sip this water throughout the day to keep your body cool. Cucumber face mask: Cucumber can be used as a natural astringent and toner. Applying cucumber slices on your eyes can help reduce the appearance of dark circles and puffiness. You can also make a face mask with a cucumber by mixing together blended cucumber, aloe vera gel and lemon juice. Apply this to cleansed face and keep it on for about 15 minutes or till it dries off. Then wash off with cold water. This face mask will help soothe redness, cool down your body and also help get rid of blemishes and suntan. You could also combine cucumber juice with a bit of curd and apply it on your face to get rid of dark spots and get soft skin. Apply this face mask only if you have dry skin. Cucumber raita: You could include cucumber in your salads. But a more wholesome and interesting way to eat it is to make a raita with it. Combine chopped cucumber, chopped onions, curd, salt, red chilli powder and chopped coriander leaves. Keep this raita in the refrigerator for some time. Serve this with your meals.